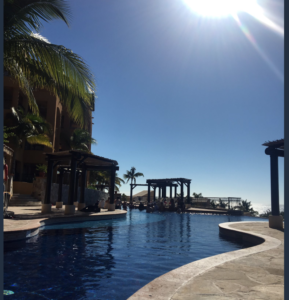 I spent the first week of October 2018 in Cabo San Lucas this year. 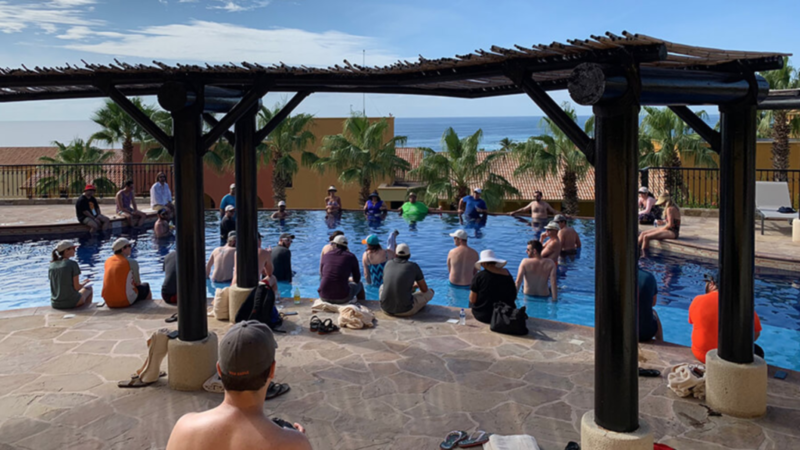 This was my second year attending Chris Lema’s CaboPress, a mastermind-conference-retreat held at Chris’s favorite resort in Cabo. Over the five days we were there, my business once again changed just like it did in 2017. I’m going to talk through what exactly was so impactful, and why I love small conferences like these. To put it succinctly, CaboPress is a week in the fall where a group of entrepreneurs and founders, handpicked by Chris Lema, gather in Cabo San Lucas at a five star all inclusive resort, the Grand Fiesta Americana Los Cabos. Tuesday through Thursday there are 2 sessions per day in a resort pool, each led by a “host” invited by Chris. This year the hosts were people like Jennifer Bourn of Bourn Creative, Brennan Dunn of RightMessage, Allison Fallon, Tony Perez of Sucuri/GoDaddy, and more leading sessions on productized services, personalization, book writing, leadership, fear, and more. They’re not really talks, but rather facilitated conversations led by someone with deep experience there. The rest of the day until dinner is free, and people either catch up on some work or relax. I tried to do less work this year in the afternoons than last, but still got stuck in my room a couple afternoons. Thursday afternoon I ignored my inbox and went to find people hanging out in a pool, and just like last year had some business and life changing conversations (thanks Ken). In 2017 there were about 50 attendees to CaboPress. This year there were 30, about half alumni (like myself) and half new. This brought, in my opinion, a great dynamic and was also small enough that you could connect with everyone. I connected with some guys who were there in 2017 but I did not get to speak with at all last year. I’m glad I got to know them in 2018! This year, I re-realized some of the same things I learned last year and learned some new things as well. I also realized, upon reflection, that I actually did apply the lessons I learned last year broader this year. This has been a big theme of my life for the last year, and it started at CaboPress. I’ve always been a skeptical person. Instead of seeing something that is working for someone and asking why, I’ve tended to roll my eyes at it. This has been to my detriment, and starting last year at CaboPress I began digging deeper into why something is working or why someone has an audience. Instead of thinking I’m always right, I’ve been seeking to learn from others. And it’s been very good for me personally and for my business, and I believe sets us up better for the long term. In 2017 at CaboPress I became painfully aware that I needed to be around good smart people more often. This translated into quite a few trips this past year in order to be around great people – San Diego in February, San Francisco in September, Cabo in October, to name a few. 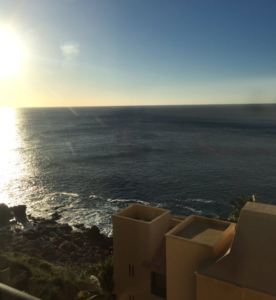 CaboPress 2018 was better for me than last year because there were already people there that I knew from both 2017 and from places like MicroConf. Because we already had a bit of relationship established, we could go deeper than before. I got to be in a lunch group with Phil and Cori Derksen of WP Simple Pay who I met in Cabo last year. I got to hang out and smoke cigars and talk about life and business and laugh with my friend Joe Casabona who is a developer, course creator, and creator of How I Built It which I got to be a guest on this year. I also got to hang out with the Beaver Builder guys and talk strategy, and learned a lot more about operating and automating an agency from Jen Bourn as a continuation from last year It truly was a phenomenal group of alumni. And I met a ton of new people. From great conversations with my roommate Sam Brodie to business-redefining conversation with Ken Wallace, and along the way hanging out with various WordPress service business operators who are at various stages of growth and struggling through similar things as me. The people at CaboPress are as top-notch as I have ever found in one location, and that is a testament to how CaboPress is set up. Last year at CaboPress 2017 I found myself in my room at times needing to do work, when what I really wanted to do was be out hanging out with people. Once I was able to get away from my computer, I was reminded that in order to experience something to the fullest you need to be fully present there. My wife and I live in Colorado so that we can be outdoors as much as possible. We backcountry ski, she runs, I mountain bike. And we love to go backpacking. We even have a tradition of going backpacking over the 4th of July weekend, and in 2018 we spent 2 days almost completely about 12,000 feet of elevation. It was amazing. And we were fully present there. No phone reception, no pinging alarms. In fact, our phones ran out of battery and it was glorious. This past year I’ve made an effort to be as present as I can where I am. We moved to Denver in late 2016 and it’s where we plan to stay, so I’ve made an effort to be present here by going to get beers with friends, engaging in the local community, and even recently got an office outside of the house. CaboPress 2017 taught me that, and 2018 reinforced it. Above all, life isn’t meant to be a slog. We sometimes think it is, but really if you’re not having (a lot of) fun then something is VERY off. We should have a good time and be able to kick back some even while we are growing businesses and being professionals. Sometimes longer weeks are necessary, but we also need to take steps back sometime to get a broader view on business and life. At CaboPress, this means hanging out in the pool with a drink in your hand and going deep with people. 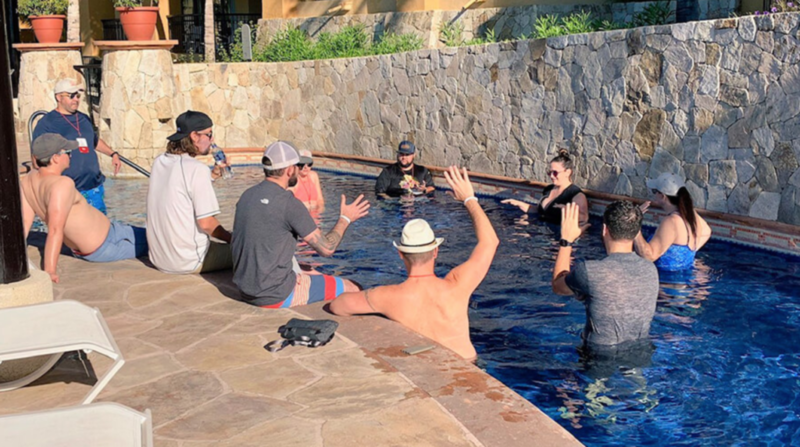 Like in 2017, at CaboPress 2018 I had some of the best and most impactful conversations of the whole time while hanging out in the pool with a beer in my hand. And it was wicked fun. CaboPress 2017 was about 60 people. CaboPress 2018 was 30, with half new attendees and half alumni. There were people at 2017 who I didn’t speak with, but I got to know this year and I am a little bit sad I didn’t meet them in 2017 because they are amazing people. I’ve always prioritized having a broad network of people, but in the last few years I’ve gone deeper with fewer people and it has been amazing for me personally and for my business. By virtue of fewer people, I felt less like I needed to meet as many people as possible and instead that I could go deeper and have quality conversations with more people. It worked, and I am better off for it. I’ll be honest – there were some people both in 2017 and 2018 at CaboPress that I judged, when I hadn’t met them yet. I’m not proud of it, but it’s true. One of my focused over the last year has been to be more inquisitive and less judgmental. Instead of being judgmental, I chose to ask myself why they might be there. And the only way to answer that was through having conversations. And through those conversations, I got to know some amazing people. Similarly, when someone questioned something in my business (as I’ll expand on below) I chose to ask “Why do you say that?” instead of immediately defending myself. Those “why”s made all the difference. Business is a journey. Sometimes what has served you well to get to this point is not going to take you to where you want to go. I think I first heard that from Wil Reynolds, but it was reinforced at CaboPress during a conversation. At CaboPress 2017, on the first night someone asked me if I was at the right table when I went to the Product table. I realized during the course of that dinner that I was indeed at the wrong table, that my business had in fact become a services business. That realization changed many things for the past year. While my business has grown well over the last year (just hired my first FT person, generated over $20M in annualized project revenue over the first 3 quarters of 2018), I’ve personally had some struggles. Don’t get me wrong – 2018 has by far been my best year when it comes to how good and stable I feel about the business, but it’s also had its hard times (some of which were caused by a bad reaction to a medication because of my herniated disc). Along the way I’ve felt like some things in the business are misaligned. Taking a step back at CaboPress let me finally see those misalignments and also how they are misaligned with me personally, the vision I have for the company, and who I am becoming as an entrepreneur and a leader. Once again, watch this space. I’d be remiss to not take a minute to thank Chris personally. Your mentorship over the last few years has been invaluable and my business probably would not be here if not for you. Thank you for being so giving to others. You’ve impacted my life and many others in a big way. And a big thanks to all of the incredible conversations I had at CaboPress 2018. Thank you Brian for both the tactical and strategic talks we had about productized services and personalization. Thank you Joe for the deeper existential chats and the great cigars. Thank you Jennifer for the continued mentorship on automation and life balance and building the business that supports your life. Thank you Chris for the deep questions and thoughts about life and business. What’s the value of an unlinked mention for SEO?